The Crewfit 150N XD offers the ultimate in advanced comfort and performance technologies. Using a modular design the XD offers a choice of covers, inflation and harness options to best suit your requirements. 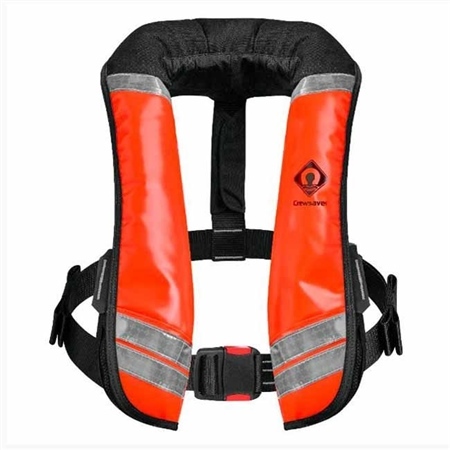 Fusion 3D technology provides complete freedom of movement and ensures the lifejacket remains comfortable even during long periods of use, whilst the unique design with built in twin waist adjusters allows for easy donning. The wipe clean cover helps to ensure increased longevity when used continuously in the harshest of working environments, whilst the 500D fabric shoulder panels retain a comfortable fit. The 150N bladder out performs approval and offers 190N worth of buoyancy. The unique buoyancy distribution provides exceptional turning solutions even when wearing heavy clothing. The bladder is highly visible on inflation and hosts an impressive array of features including a built in chin support, location beacon attachment points and dual lifting beckets. Fusion 3D ergonomic shape for comfort and freedom of movement. Wipe clean cover with 500D fabric shoulder panels for easy cleaning and comfort. Indicator window with protection panel and Hypalon retainer. YKK tri-point quick burst zip. Supplied with dual crotch straps.